Tremolo tones from the of 50′s type soft swing to deep modulation with great playability. 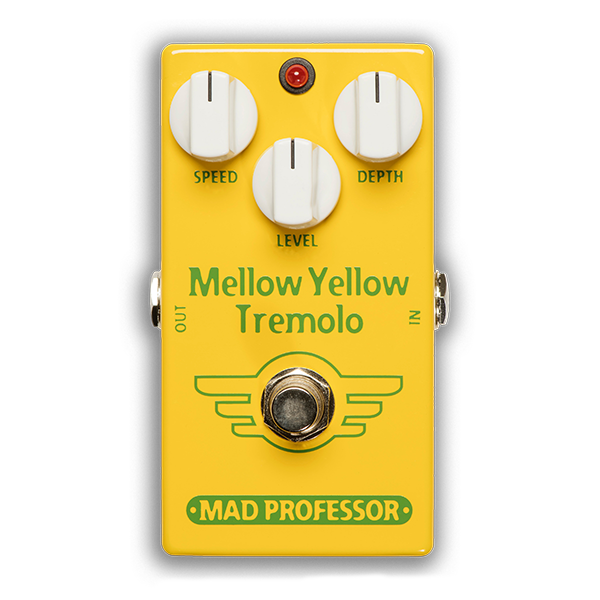 Mad Professor Mellow Yellow Tremolo (MYT) is a true sine wave tremolo effect designed for tremolo tones from the of 50′s type soft swing to deep modulation with great playability, regardless of tremolo depth or speed. The strength of the incoming signal is modulated by a sinusoidal oscillator, just like in the early amps, and modulation bias is set to give symmetrical modulation. This gives a very musical tremolo effect that blend very well with both clean and distorted guitar tones. The MYT has a level control that allows you to even boost the signal for a more powerful effect.